The PLEXUS allows you to send data via MADRIX using 1024 DMX channels per device. The MADRIX PLEXUS features two 5-pin, female XLR connectors. Please use XLR adapters if necessary! This chapter describes how DMX512 can be used to connect your MADRIX PC to the MADRIX PLEXUS via USB to output DMX data. Please make sure to install the MADRIX software first. For more information about the installation process, see the MADRIX PLEXUS Quick Start Guide or the MADRIX Help And Manual. Now, please connect the MADRIX directly to a free USB 2.0 port of your computer. If the MADRIX PLEXUS driver has been installed properly, the status LEDs will light up accordingly, as described in the chapter Troubleshooting. You will need to configure your virtual LED matrix according to your LED installation. In MADRIX, navigate to the menu 'Preferences' > 'Matrix Generator...' or 'Preferences' > 'Patch Editor...' for this task. For more information, please read the MADRIX Help And Manual. In MADRIX, navigate to 'Preferences' > 'Device Manager...' (or press 'F4'). The first tab 'DMX Devices' shows a list of connected devices. Click this button if your device is not shown in the list in order to search for connected devices. 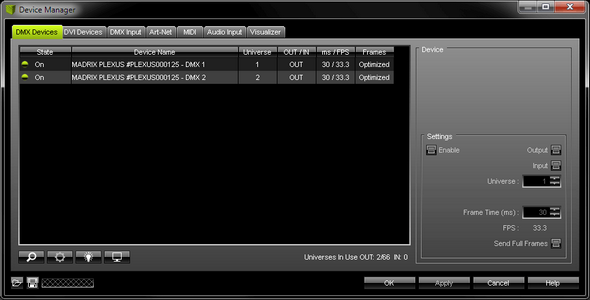 Two list entries will be created for your PLEXUS device, one entry for every DMX port ('DMX 1' and 'DMX 2'). By default, 'Enable' as well as 'Output' should be enabled for every DMX port. Please check if both options, 'Enable' and 'Output', are activated! Your PLEXUS device is now configured to output DMX data. In the next step, set up the DMX 'Universe' for each DMX port. Simply use the two arrow buttons to adjust the values. Click 'Apply' afterwards. Make sure that this configuration match the settings of your virtual LED matrix of the Patch. You can also define the 'Frame Time' in ms for each device. Frames per second (FPS) will be adjusted automatically according to the frame time. Setting up the frame time can help in different cases. For example, certain LED fixtures might work best with a specific frame rate. Make sure to use the optimal frame rate for your fixtures. Some LED fixtures might have problems with high frame rates. Then, you can increase the frame time and the FPS will be adjusted automatically. Always click 'Apply' to activate any changes you made. 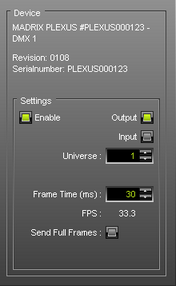 Activate 'Full Frames' if PLEXUS devices should always send full frames, instead of optimized frames on a particular universe. Sending full frames means that always the full 512 DMX channels of a DMX universe will be sent with every frame (even when you are using less than 512 channels per universe). Otherwise, MADRIX will send the number of DMX channels that is configured. Always click 'Apply' to confirm any changes you made. The 'Highlight' button activates/deactivates the highlight mode for the selected device and universe. Select one ore more interfaces and click the button. The corresponding fixtures connected to the selected interface(s) will completely light up white for a better identification. This makes it easier to see them on stage. It considerably speeds up the procedure of programming the selected DMX512/Art-Net interfaces. In addition, the display of selected PLEXUS devices will flash regularly. Open the 'DMX Watcher' to monitor your DMX output or input. 'Watch Universe' will appear when you have selected a list entry. The DMX Watcher will open with the particular DMX Universe already entered. Click 'OK' when you are finished setting up your devices.